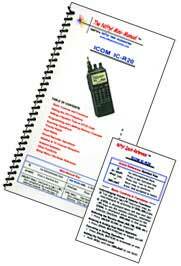 Some customers have been asking for our older, discontinued ham radio guides. This page lists products that are no longer in production but still available for purchase in very limited quanties. Some radios only have a single guide remaining. So hurry if you want one of these ham radio guides because when they're gone they're gone! The guides listed below are also available, however there is no product page. If you want to purchase a guide below, please email us at support@niftyaccessories.com with the items to purchase and your PayPal email address. A PayPal invoice showing the total cost including shipping will be emailed to you. Once payment is sent via PayPal your order will ship. This is the only way to purchase the guides below.